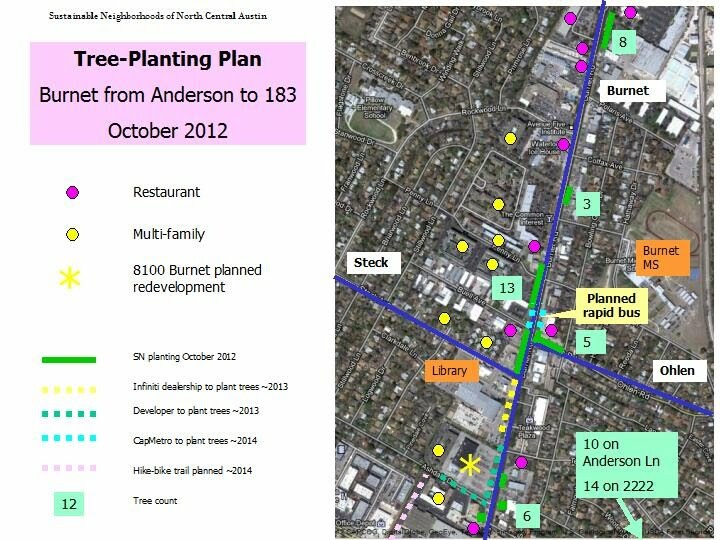 The tree planting on Burnet is back on track and will take place Saturday, November 10, 2012, 9 am to 12 noon. Rain date or follow-up date is Saturday December 1. Meet in the Shu-Shu's parking lot on the northeast corner of the intersection of Burnet-Ohlen. We expect to plant about 35 trees on Burnet from Anderson to 183, and 20 trees on 2222. The Burnet Rd trees will create a forest in support of the rapid bus station (coming 2014), restaurants, nearby apartments, the Steck Library, Burnet Middle School, and other nearby destinations.